and a very fine speaker overall. Sound Laid-back, smooth-sounding two-way with articulate and defined bass; tremendously engaging with single-ended amps -- 13Wpc minimum. Features Very solid construction with serious attention to detail; two sets of binding posts for biwiring; upgraded internal components and wiring that standard Shearwaters dont have. Use Easy to set up and very easy to drive; more focused with a slight degree of toe-in. Value You get a lot for the money -- high-performance drivers in a well-designed, well-built and attractive cabinet stuffed with premium parts and wire. And no stands needed! Human behavior is a funny thing (not counting times of war, the bleacher bums in Oakland, and most of the guests on Jerry Springer). If some advertising genius on Madison Avenue puts some flashy stripes on a pair of poorly designed running shoes or some artificially colored sprinkles on the world's worst doughnut and markets it 24 hours a day on MTV or ESPN, it is basically a given that most of us are going to buy it at some point. It is in our nature to follow the crowd, be seduced by quantity and glitz over substance, and overpay for products that we think must be the best because some 6' 9" power forward who gets $9 million a year uses them. It seems that nothing is worthy anymore unless it brings immediate gratification to its owner. This type of short-term thinking unfortunately runs rampant in the audio kingdom as well. Our job at SoundStage! is to cut through all of the marketing mumbo-jumbo and tell you how a component sounds and whether it represents real long-term value. Are you interested in buying a great piece of equipment that will enhance your enjoyment of music or are you just trying to show off your credit-card limit? I know the answer here -- for most of us, at least. Music lovers -- follow me! California-based Meadowlark Audio has grown quite significantly in the past few years, and none of its success can be attributed to an expensive advertising campaign. Pat McGinty's speakers have essentially been selling themselves by word of mouth. SoundStage! reviewed the $995 Kestrels back in 1997, and after that very positive review, the demand for more information on this relatively unknown company and its other speakers was quite strong. The Hot Rod Shearwaters are medium-sized (40"H x 9"W x 11"D) two-way floorstanders that weigh in at a manageable 65 pounds each. Despite their height, the HR Shearwaters have a very narrow footprint and do not take up a lot of space. The 1"-thick cabinet is extremely well braced (it hurts a lot if you hit it), and I found it relatively resonance-free at sane listening levels. Meadowlark uses a layer of Keldamp proprietary damping material inside to further deaden the cabinet. The HR Shearwaters are a transmission-line design with a port on the rear panel of the cabinet. Pat McGinty uses this type of design because he believes that it allows him to get superior bass articulation and extension out of such a small speaker. The HR Shearwater's cabinet is impressive both inside and outside. Meadowlarks master cabinetmaker, Robert Lane, deserves recognition for some truly beautiful work. I had review samples in rosewood and cherry finishes, and both were very lovely. The drivers utilized in this design are equally impressive. The HR Shearwaters use a very expensive 7" carbon-fiber woofer from ScanSpeak and 1" silk-dome tweeter from the same Danish manufacturer. The tweeter has an acoustic pad that surrounds it to control diffraction and reduce dispersion. Both drivers are decoupled from the baffle with (you guessed it) another layer of Keldamp. Meadowlark burns in both drivers at the factory for several days, but as I discovered with my two review samples, the 7" carbon-fiber woofer takes a very, very long time to break-in. How long? Ahhhh, if you buy them before Christmas and play them every day up until the beginning of spring training, you should be OK. All kidding aside, these speakers take 200300 hours before they sound their best. I was fortunate enough to have a pair of brand-new HR Shearwaters and a broken-in pair as well, and I can confidently state that they sound totally different after the first few weeks. Patience is a serious virtue with these speakers, and one should never forget that great things come to those who wait. The HR Shearwaters' frequency response is stated as 35Hz to 22kHz, +/- 3dB, with a sensitivity rating of 88/dB/W/m. They are an 8-ohm load and relatively easy to drive (I can hear the mice of the single-ended crowd clicking furiously). I drove the HR Shearwaters with six very different-sounding amplifiers (two solid-state amps, two push-pull tube amps, and two single-ended amps) and my choice in amplifiers taught me a great deal about this speaker. Six watts are not sufficient to drive this speaker, regardless of how wonderful those 6 watts might sound. Based on my experience, I would say that the 13Wpc Art Audio Diavolo is the absolute minimum as far as power is concerned (and keep in mind that the Diavolo is much more powerful than its power rating would suggest). I listened to the Meadowlark HR Shearwaters in systems using the Copland CTA-301 Mk II preamplifier, EAR 834P phono stage, and Copland CTA-501 integrated amplifier. I also drove the HR Shearwaters with a KR Enterprise 18 BM single-ended power amp (18Wpc), Art Audio Diavolo single-ended power amp (13Wpc), Copland CTA-505 power amp (65Wpc of push-pull tube power), OCM 200 (100Wpc of solid-state power) power amp, and the Primare 30.1 integrated amp (80Wpc of solid-state power). I compared the HR Shearwater to the Meadowlark Kestrel, the physically identical standard Meadowlark Shearwater, and Martin-Logan Aerius speakers. I used my Copland CDA-288 CD player and Rega Planet CD player to evaluate the HR Shearwaters with CDs. 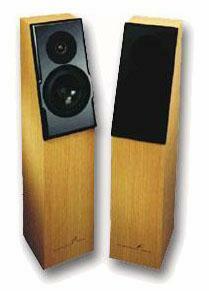 My Audiomeca Romance/Wilson Benesch ACT.5 /Benz-Micro Glider setup was used to evaluate the speakers with vinyl. Cables included Cardas Neutral Reference; van den Hul The First, Second, and Revolution; Nirvana SL; and the reasonably affordable Axon cables from France. I plugged everything into Chang 6400 and 3200 line filters. A Foundation Research line filter was used with the various power amps. DIY acoustic treatments made my 17'L x 15'W x 7' 6"H listening room sound much, much better. The HR Shearwaters come with two sets of widely spaced Cardas solid-copper binding posts that had no problems accommodating thick spade connectors (biwiring is the word of the day here). However, the posts are located relatively close to the floor, so audiophiles who use extremely thick and stiff speaker cables should note the possibility of having some hook-up problems with the speaker. The HR Shearwaters are not terribly difficult to set up. Meadowlark provides an extremely thorough manual that gets top marks from me for being clear, informative, and free of audiophile condescension. If one happened to be a newbie to the world of high-end audio, I would find the setup instructions paramount to getting the most out of this design. Meadowlark supplies a "sock" grille cover with all of its speakers, and while it does not negatively affect the sound of the speaker in any significant way, I find that all of the Meadowlark designs sound better without their socks. The grille covers also have a tendency to tear, especially if you are constantly putting them on and taking them off. The supplied spikes are very sharp and had no problem piercing my carpet and making solid contact with the concrete underneath. The HR Shearwaters can move a lot of air. I would suggest that a distance of two feet is the minimum these speakers should be placed from the rear wall, or you risk overloading the room with bass. The HR Shearwaters also need a minimum five feet of separation to really open up and sing. Meadowlark suggests in its manual that the listener should be seated no less than seven feet from the speakers. I would agree with that and add a foot or two. The closer you sit to these speakers, the more aggressive they sound, and the extra few feet of distance between you and the drivers makes a world of difference. I ended up with the HR Shearwaters placed 45" from the rear wall (from the front of the baffle) and 33" from the side walls. I dont usually toe-in my speakers, but with the HR Shearwaters, I found that a small degree of toe-in improved the focus without robbing the sound of its warmth. I mentioned earlier that the HR Shearwaters take a very long time to break-in. When the speakers are fresh out of the box, their bass sounds extremely dry and lacking in definition. The treble also lacks a certain degree of air, but it does change quite dramatically over time. Once the drivers finally loosen up, the real HR Shearwaters show up. Tonally, they are a tad dark-sounding. They do not have the pristine, open, transparent sound of the Martin-Logan Aerius (I cant think of a cone speaker that does). The HR Shearwaters are neutral-sounding to the extent that they dont suffer from any significant colorations in the midrange or treble, but they are also not "clinical" at all. The HR Shearwaters, as I discovered by trying six different power amps, are neither overly excitable nor overly polite. They methodically draw you into the performance without ever really going over the top and ruining the show. Listening to Green Days Nimrod [Reprise CDW 46794] was an enormous amount of fun. I listen to Green Day at levels that would send most people running from the room, and I was quite impressed by how focused and clean the sound was at these levels. The HR Shearwaters had no problem at all with the heavy-duty pounding and bass lines from Mike Dirnts Fender Precision bass, and Billie Joes voice and guitar playing on "Time of Your Life" was startlingly real-sounding. The HR Shearwaters gave the Martin-Logan Aerius a real run for its money with this disc. The treble was extremely clean and it never came close to ripping my ears off. I pulled out my copy of Smashing Pumpkins Siamese Dream [Virgin V2 0777-7 88267-29] to see if the HR Shearwaters were more than just a one-disc wonder. The guitar playing on this disc is a very serious reason why you should own a copy of it, and I couldnt resist the temptation to get out of my chair and play air guitar along with James Iha. The HR Shearwaters can rock out with the best of them. The bass response is extremely powerful, yet articulate and well defined. This speaker never sounds sloppy. Not bad for being driven by 13Wpc single-ended tube amps. No, do not adjust your set. The best sound that I achieved while listening to the HR Shearwaters came from the two single-ended power amps that I had around during the review. There was no contest between these two low-powered (KR Enterprise 18 BM, Art Audio Diavolo) power amps and the other four designs. The OCM 200 would be an ideal amp for this speaker if it were more open-sounding. Its midrange was wonderfully clean, but I found the overall sound somewhat boring. The two Copland amps warmed things up, but they really showed a weakness in the bass department. I was somewhat surprised by this, considering how good they both sound with the Meadowlark Kestrels. The single-ended amps (using the Cardas and Nirvana cables) were a wonderful match with the HR Shearwaters, giving music a degree of vibrancy and emotion that the other amps failed to deliver. The Art Audio Diavolo gets the nod in the bass department with this speaker. Many 200Wpc amps dont do bass as well as this 13Wpc beauty. I kid you not. I probably used close to 30 jazz recordings while evaluating the Shearwaters, and it did not matter if I was listening to Miles Davis, Bill Frisell, John Coltrane, or Gene Ammons. These speakers are a must-hear if jazz is what boils your blood and makes you feel alive. And blues lovers should not feel left out. Drink Smalls Electric Blues Doctor Live! [Mapleshade 01832] is one of the best live recordings of an electric guitar that I have heard. Listening to this recording through the HR Shearwaters was a really emotional and moving experience. I closed my eyes and listened intensely to every note that slid off of Mr. Smalls fingers. The sound was sweeter than a freshly glazed Krispy Kreme doughnut. Comparing the HR Shearwater to the Martin-Logan Aerius is an invaluable exercise. The Aerius reproduces the human voice in a manner that humbles many speakers. Electrostats have built their reputation on the transparency issue, and I did not expect the HR Shearwaters to push the Aerius as hard as it did. Tori Amoss Under the Pink [East/West CD 82567] has wonderfully clean vocals, and the Aerius reproduces them better than most. The HR Shearwaters driven by the KR 18 BM and Art Audio Diavolo were beautifully open and detailed with this recording, and I was hard pressed to choose between the two speakers. The Shearwater handles dynamic shifts in the music much better than the Aerius and is far superior when the bass kicked in. The Aerius is somewhat restricted in that department, and they were no match for the Meadowlarks when playing Green Day or Smashing Pumpkins. I was also fortunate to have pairs of the Meadowlark Kestrels and standard Shearwaters around for comparison. First, the Kestrels and the standard Shearwaters do not share the same sonic signature. The more expensive older brother sounds cleaner in the midrange and has a much sweeter-sounding tweeter. Surprisingly, the standard Shearwaters do not have an enormous edge in the bass department over the Kestrels -- perhaps a tad more definition and overall slam. The standard Shearwaters dont reproduce a wall-to-wall soundstage like the Kestrels do, but they do reproduce spatial information much more convincingly. Performances in general have a greater sense of scale. The real test, however, is how the regular-issue Shearwaters stand up to the Hot Rod model. The HR Shearwaters sound smoother in the treble to my ears. Listener fatigue was never an issue with either model due to the clean-sounding tweeter used in both, but the standard Shearwaters suffer from a little more glare as you jack up the volume. Interestingly, the HR Shearwaters also sound more revealing, and I definitely heard more of what was on each recording with them in use. This could be detrimental, however, if your sources are slightly aggressive. The HR Shearwaters reproduce a deeper soundstage and are cleaner in the midrange. I could very easily live with the midrange of the standard speakers, but the nicely layered soundstage is another matter. Male vocals sound a bit fuller, but I would be exaggerating if I said that the difference was enormous. One area where the HR Shearwaters are much better is in the bass. The standard speakers lose some definition and punch as the volume increases. Overall, the Hot Rod Shearwaters' presentation has more vibrancy and authority. The standard Shearwaters are excellent speakers, but I must confess that I would pay the extra $500 for what the Hot Rod Shearwaters offer above and beyond. Has Meadowlark Audio done something extraordinary here with the Hot Rod Shearwaters? The answer is an enthusiastic YES! Aside from the HR Shearwaters somewhat dark-sounding tonal balance and general laid-back demeanor, I dont think that these speakers have any serious shortcomings. They are very easy to drive, gorgeous to look at, exceedingly well put together, intensely moving, and musically engaging -- and at $2900 a pair they are a bargain in a crowded market filled with overpriced underachievers. These speakers are a long-term purchase for those with a yearning for great sound at a truly justifiable price. Are they really $500 better than the standard Shearwaters? I think so. Are they the best speakers that money can buy? No, but based on the 20 or so pairs that Ive heard in the $2000$4000 range, they are certainly at the top of their class.